The family of a Scottish man being held in India accused of terrorism offences will meet Foreign Secretary Jeremy Hunt next month. They want to secure the release of Jagtar Singh Johal who was arrested in Punjab in November 2017. Relatives of the 32-year-old Sikh from Dumbarton allege he has been tortured and mistreated in the prison where he has been held for more than 500 days. He is accused of involvement in the murder of a Hindu nationalist leader. MP Martin Docherty-Hughes said Mr Johal's family were determined to prove his innocence and "secure justice on his behalf". He added that he was disappointed that the meeting with Mr Hunt had taken so long, but it was a welcome step forward for campaigners. Mr Johal is one of 10 men accused of being involved in the murder of Hindu Nationalist leader Ravinder Gosain. India's anti-terrorism unit alleges that Mr Johal delivered cash to the ex-head of the Khalistan Liberation Force (KLF). The charge sheet by the National Investigation Agency (NIA) describes the separatist group, the KLF, as a "terrorist gang". It alleges that his murder was part of a wider international conspiracy by the KLF - which included five other killings and an attempted killing. Details run to more than 50 pages but only a small part covers Mr Johal's alleged involvement. 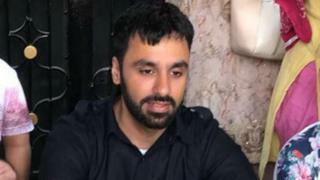 Mr Johal was arrested two weeks after his wedding in Punjab. His family and campaigners say he is innocent and that he has been tortured during his detention. They said he was a peaceful activist who had contributed to a website remembering the 1984 massacre at the Golden Temple at Amritsar, but was not a militant. Mr Docherty-Hughes, the family's constituency MP, secured the meeting with Mr Hunt for Mr Johal's family at the Foreign Office in April. He said he had concerns that Mr Johal had been denied an independent medical examination to investigate torture allegations. He added: "This has been an extremely distressing experience for Jagtar's friends, family and loved ones here in Dumbarton. "They are determined to prove Jagtar's innocence and continue to work tirelessly to secure justice on his behalf."